We created the COOP as great place for moms (and dads and nannies and grannies!) to hang out and play or party right alongside their kids. We wanted to create a space that adults would love as much as their kids did. And we are so so proud to stand here 5 years later KNOWING that we did just that. And for that – we thank you – all our wonderful customers. Starting February 1st, The COOP will be doing private parties and playdates every day of the week EXCEPT Tuesday. Tuesday is the only day we will be open for drop in play… but we will ALWAYS be open on Tuesdays! We promise to NEVER book a party or event on a Tuesday. If you want to play… Tuesday is your day!!! If you want to party or host a private playdate – you can now do so during the week! 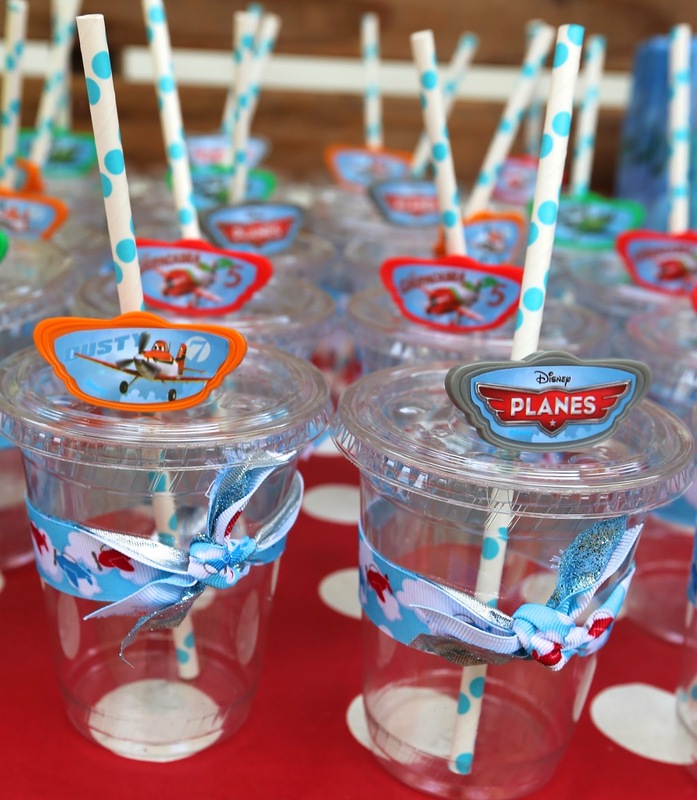 After school birthday Parties ON your child’s birthday! Private Pizza Party after a half day at your school! 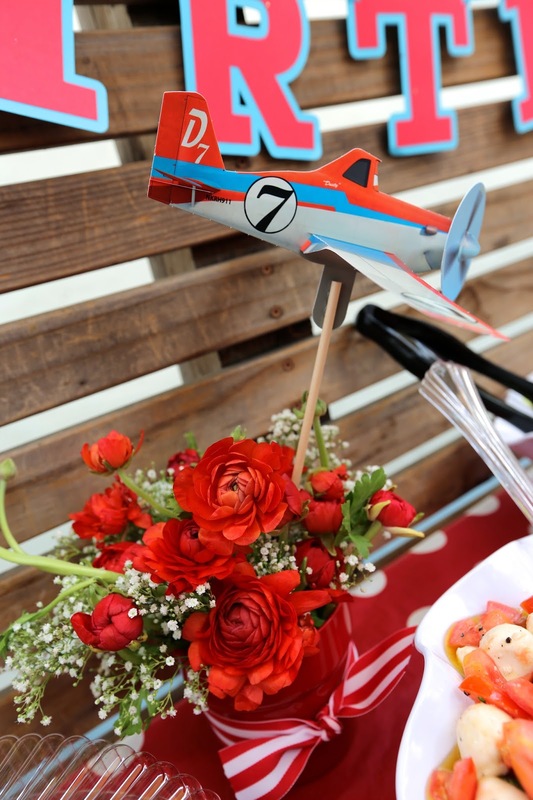 Give us a call 818-760-9613 and we can get working on the PERFECT celebration just for you! 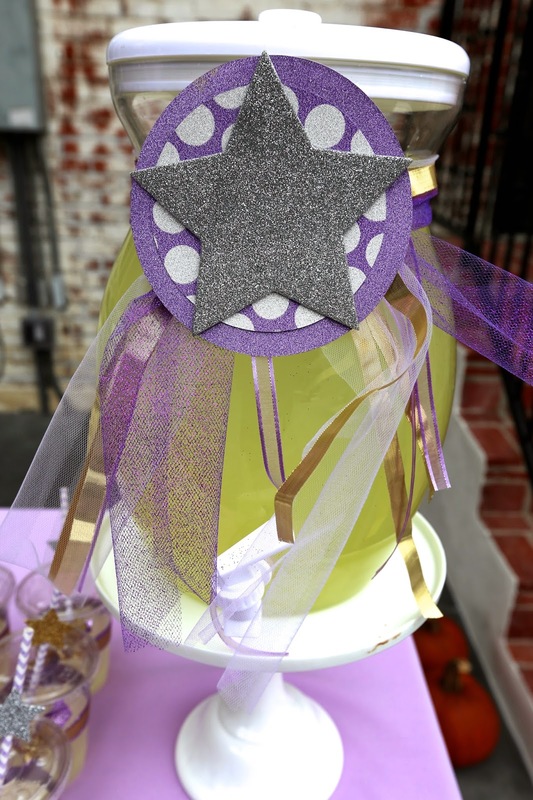 One of our lovely celeb clients wanted to do a great party for her daughter in her backyard. She let her daughter really take the lead on what she wanted -- and boy did she have some fabulous ideas! 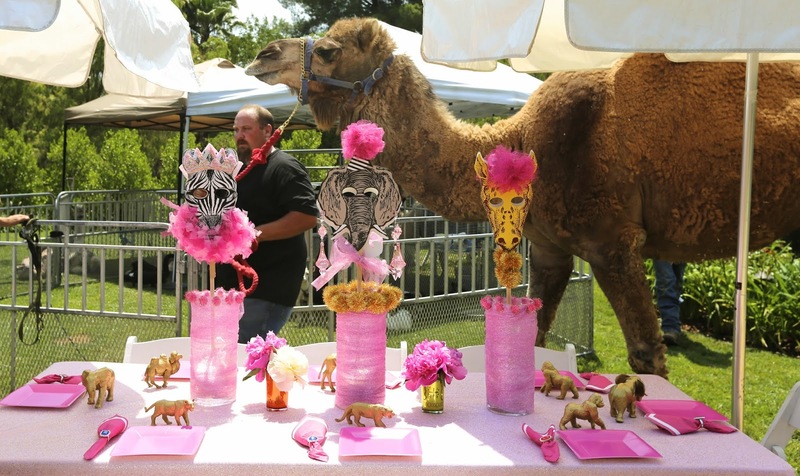 She wanted a safari party -- wanted a petting zoo, for sure! But not your everyday petting zoo for this superstar. We got her an exotic petting zoo with zebras, camels the kids actually RODE in the front yard, and all sorts of other fab creatures. She also wanted Glam -- a spa service came in and did full service treatments on all the little ladies after they swam and played (and rode camels!) all day! We needed a way to blend these two ideas together so we came up with GLAM SAFARI. 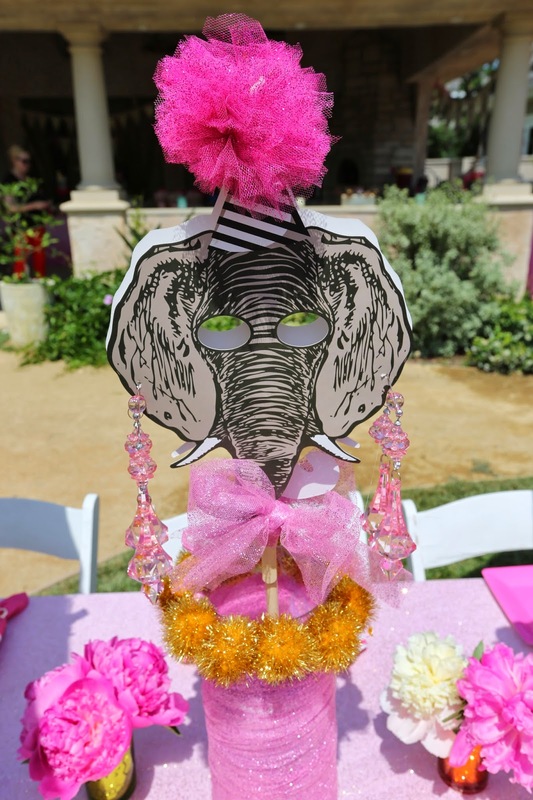 All of our favorite Safari elements -- glammed and glittered and gilded to make them extra FABULOUS!!!! 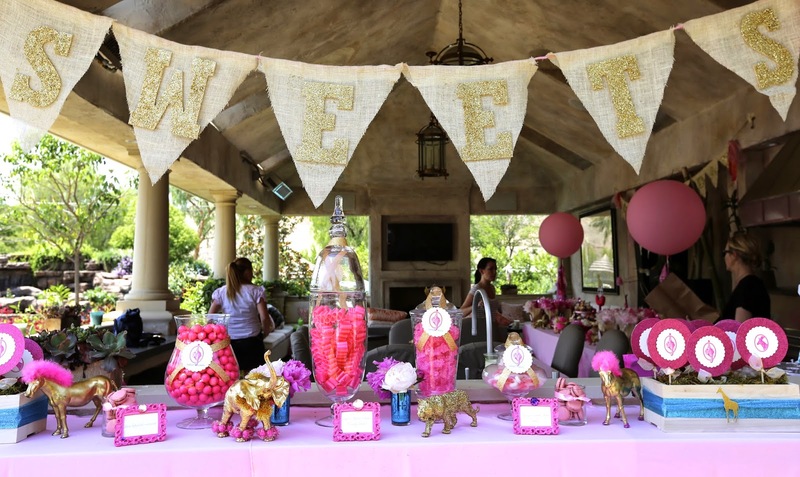 Candy bar was another MUST have... so we did a SWEET section that the girls absolutely adored. 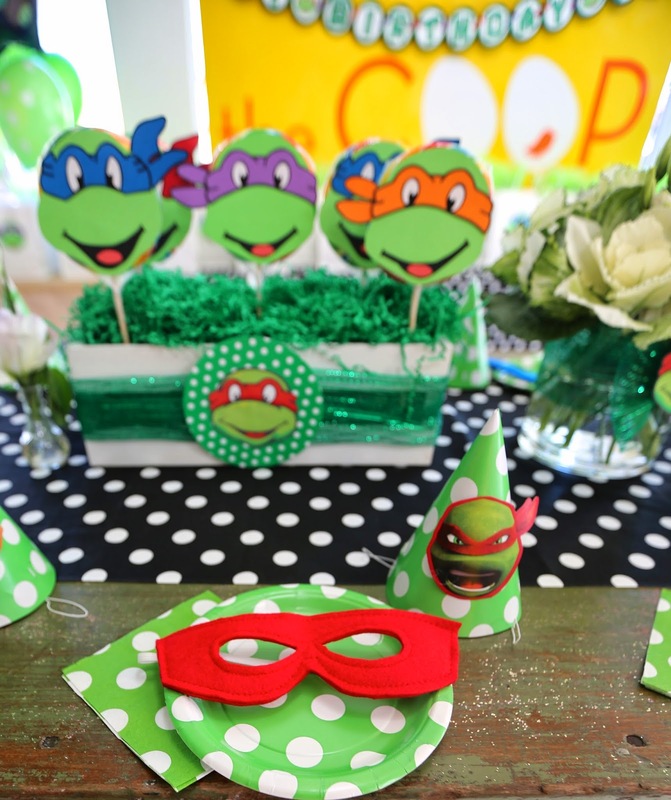 We love how this party turned out. 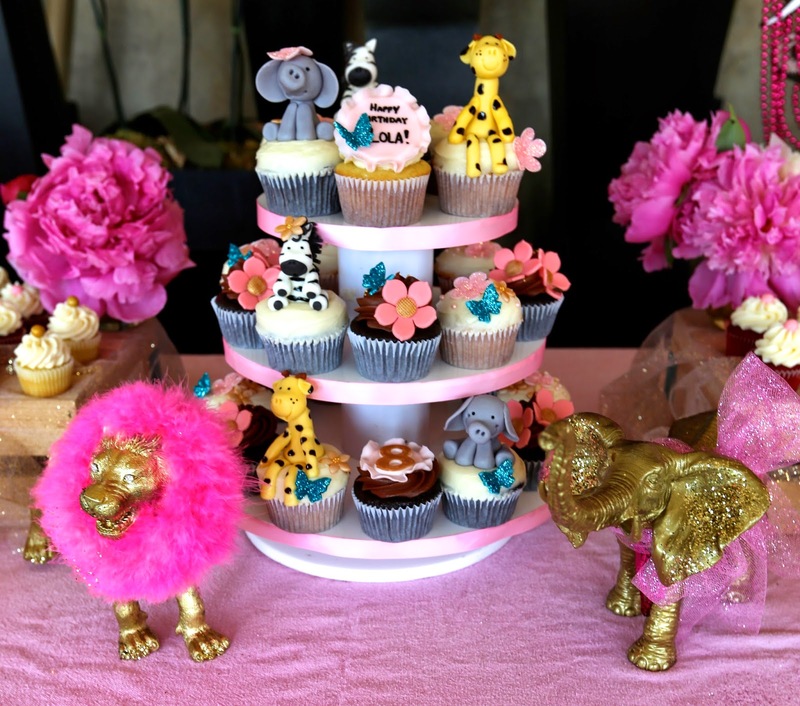 The pink ... the gold... the animals. It was just gorgeous and fun and all that we hoped for -- and more importantly all the birthday girl hoped for AND MORE!!!! 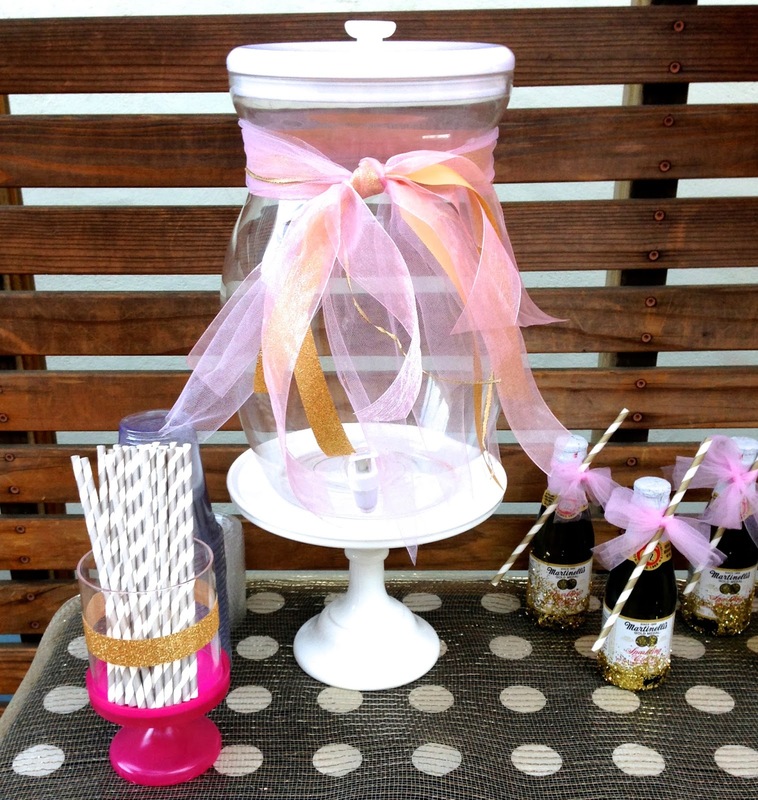 We just did this COOP Party at Home for a clients beautiful little girl's first birthday. 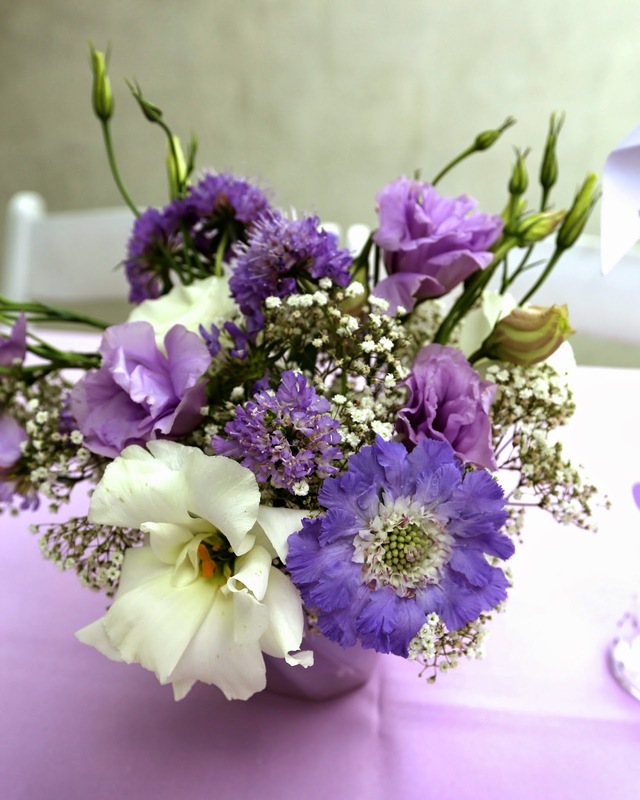 The family is beyond lovely -- and the extended family that were all in attendance on the big day were SOOOOOO FUN! 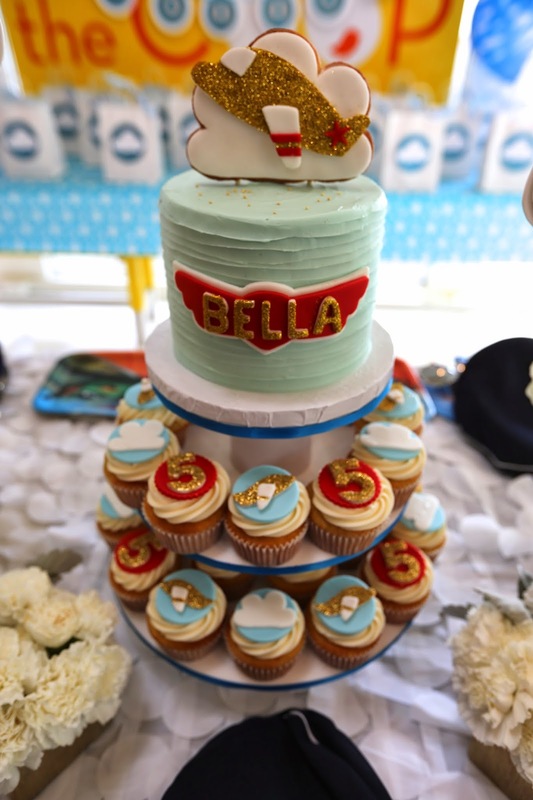 It was such a fun celebration for a fun little girl. I swear -- I have never met a more good natured 1 year old (and I HAVE a one year old!!). All she does is smile and laugh and dance. LOVE her. It's tough at 1... because they don't really have very solid interests just yet. Mom said all she loves is music. Music and dancing. WE were lucky enough to score TWINKLE TIME to perform a set for the little ones in the back yard -- which was a HUGE hit! 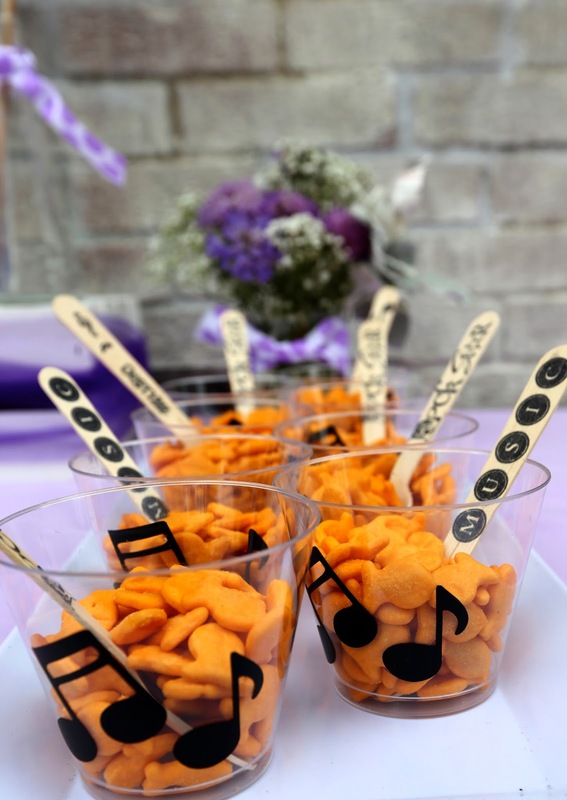 For our decorations -- we just kept it simple and music related. 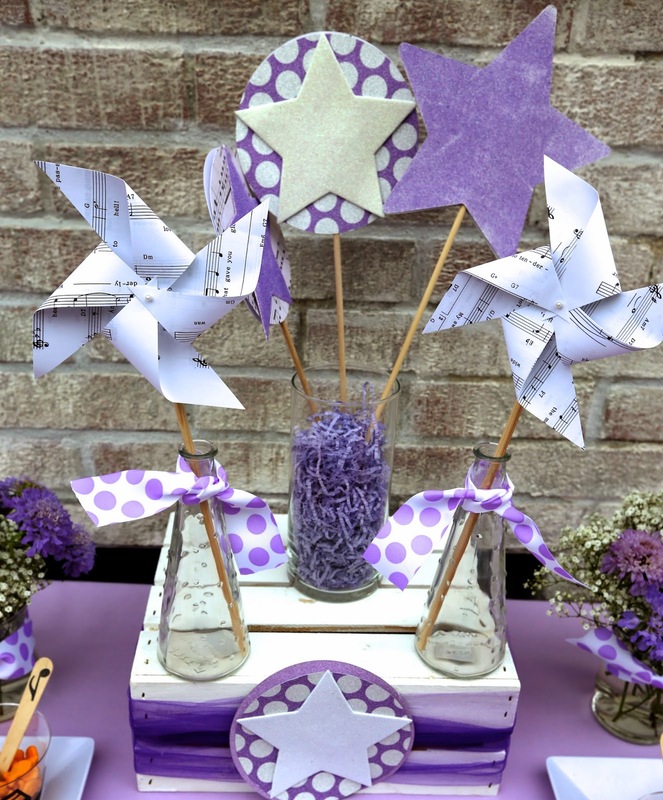 Did Stars on the goodie bags for the mini rock stars... and LOVED the pinwheels made out of sheet music that we used for the centerpieces on the tables (along with some glittery stars and gorgeous flowers OF COURSE!!!) I think my favorite thing was the star garland (made from sheet music as well!) we hung with the Happy Birthday Banner over the treat table. First of all... I mean -- how gorgeous does that look!? It looks like a party at a French country estate, right! Love how it came together. Love love love this family -- loved how the party looked and was so so happy that they were just THRILLED to have had the COOP make their day so perfect! Ohhhh -- I LOVE this party. This is one we did for a lovely 15 year old girl recently. She is a bit older than our "usual" patrons -- so I got to go a little more sophisticated with the decor. 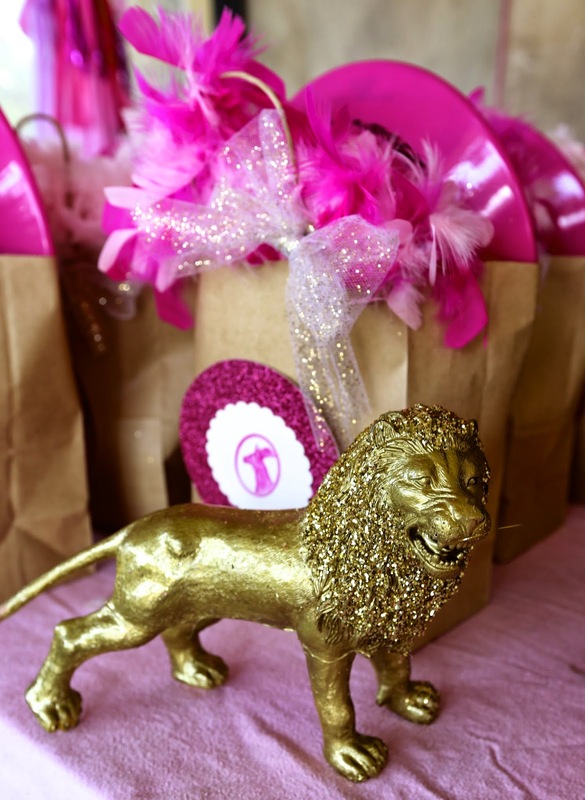 The goodie bags were still super fun ... and the party was all girls so we had fun with dress up elements!! We did different PIXAR characters -- the "Jessie's" got red tutus and cowgirl hats, the Minions got these hilarious Minion hats with a yellow tutus and yellow boas, the lady "Sullys" got turquoise tutus, a purple boa and a Sully mask, and the "Mike Wasowoski" girls got a green tutu and boa and Green wig. They were such a hit -- the SECOND each girl arrived she ran over -- grabbed an alter ego for the evening and got dressed! They were so playful and fun... makes me hopeful that my own little girl will still be sweet when she's 15!!! 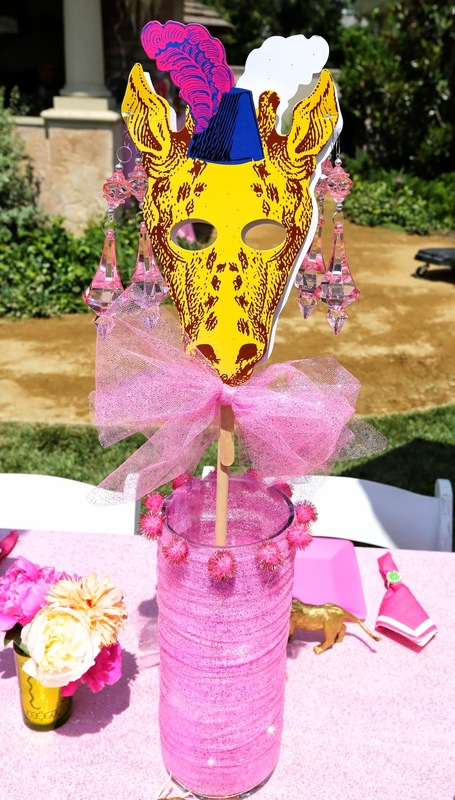 For the decor -- I just went with pink and gold glitter, basically! 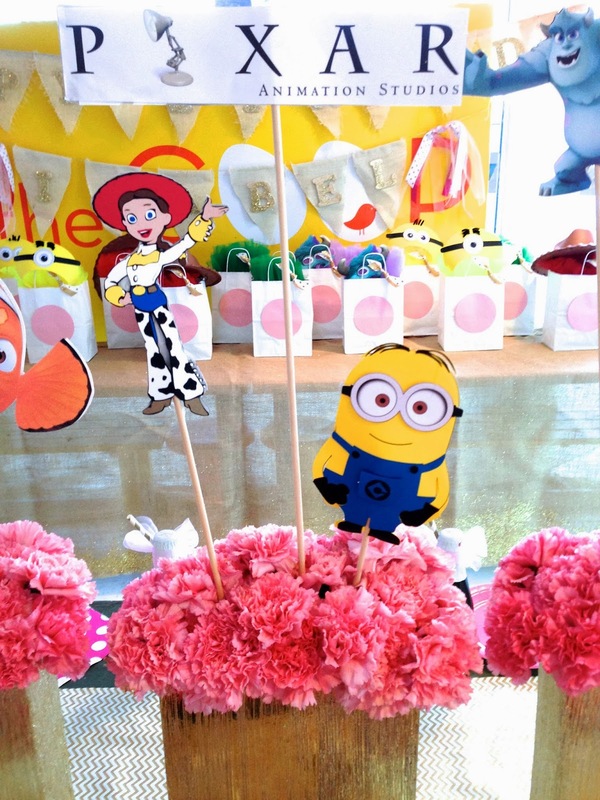 Pink carnations in gorgeous gold vases ran down the whole table -- and I made cut outs of the birthday girl's favorite PIXAR characters to include in the centerpiece. I also did her name in wooden block letters in front of the vases. 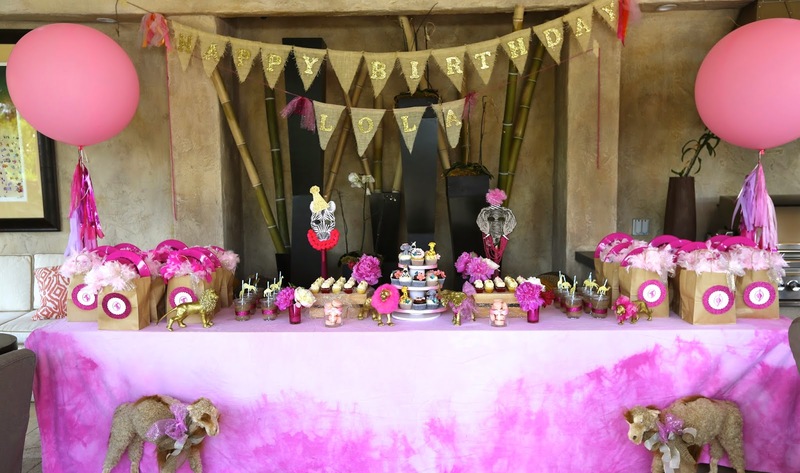 The birthday banners were all glittery gold an natural burlap with loads of pink ribbon accents. 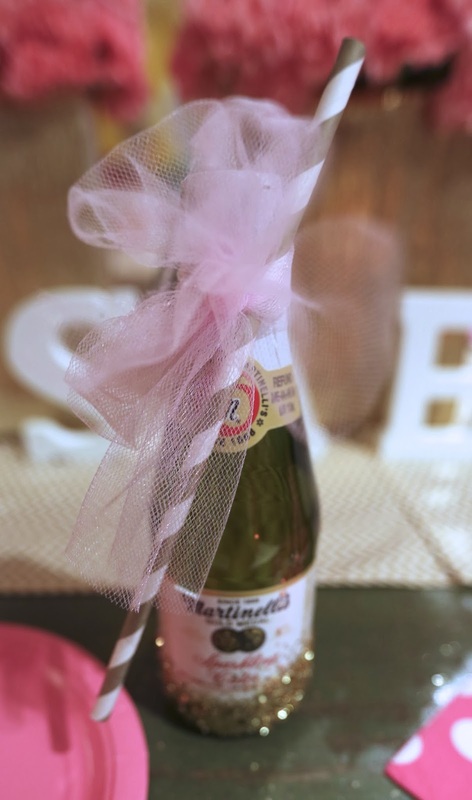 I kept it COOP-ie with the pink dotted napkins and LOVED the mini glass Martinelli's apple juices -- glammed up with glitter and tulle bows. Love love love them!! 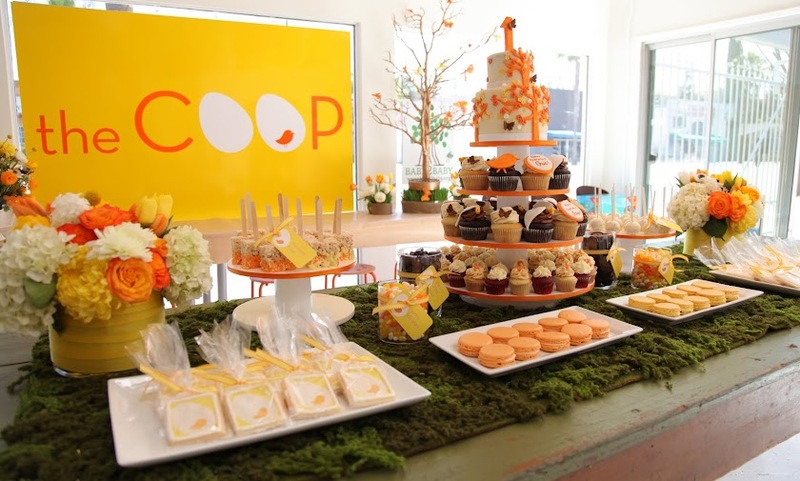 You are NEVER too old to have a FAB bash at the COOP -- and I think this party proves just that!!! 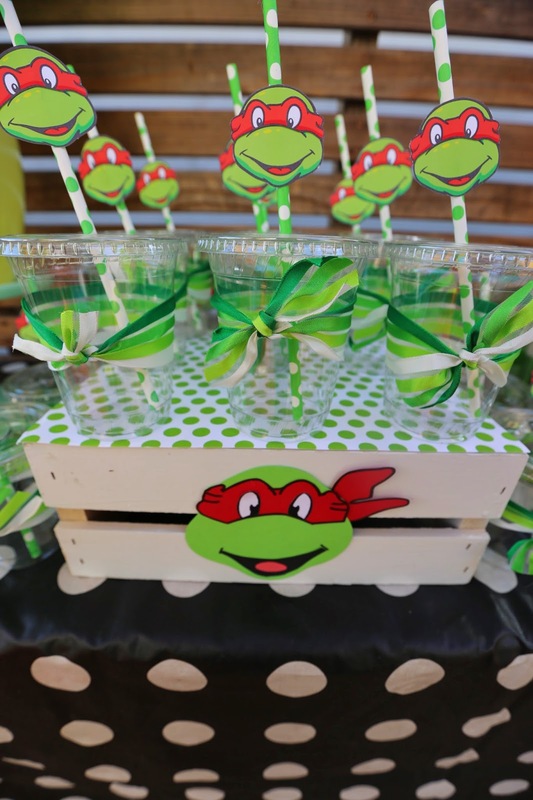 We did a really fun TMNT party for one of our favorite families recently! They are so so lovely and fun and have 2 boys (the Power ranger party is also theirs!) who LOVE to party and play at the COOP! 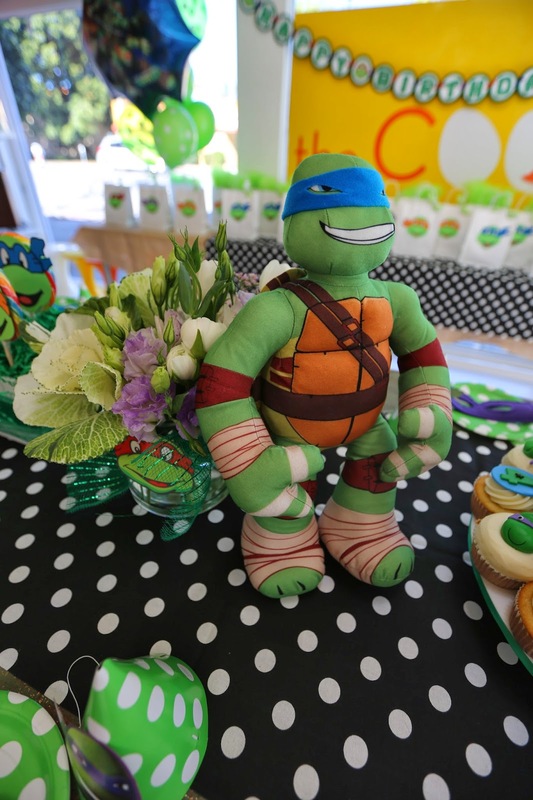 We keep everything mod and cool -- while still maintaining the TMNT fun. WE love our dots at the COOP -- so we used bright been and white, and black and white dots as our main color scheme for this fun one! 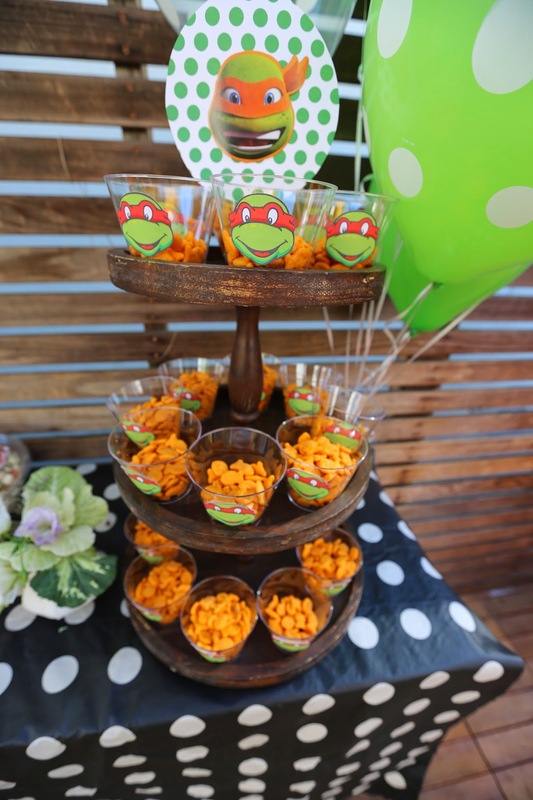 Green dotted plates with the turtle masks on top really gave a graphic modern look to what could've been a cheesy cartoon party! 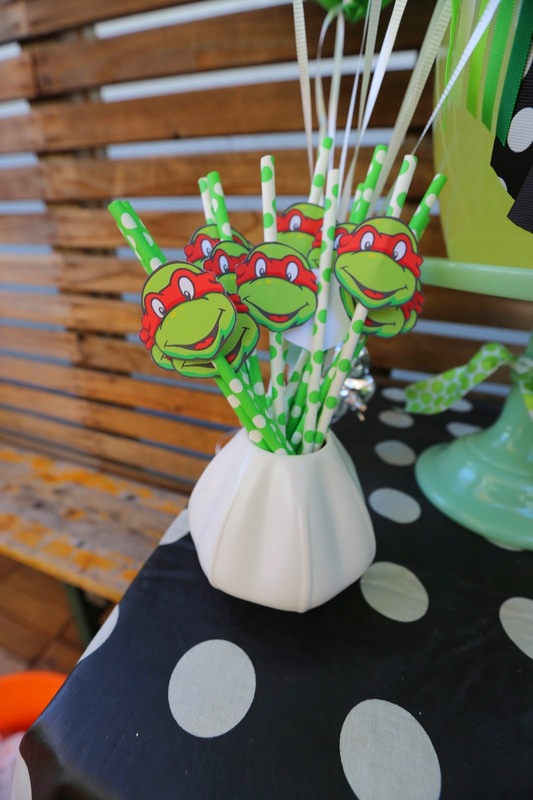 Likewise -- we went with just the cute little turtle faces as the decor on the goodie bags and lollipops. It a fun way to drive the theme home. One cool image on lots of different elements (goodie bags, lollipops, lolli holders, party hats, drink container, flower vases...) The Whole COOP and CABOODLE package comes with cupcakes -- and as usual Julie from Blue Cupcakes did not disappoint. 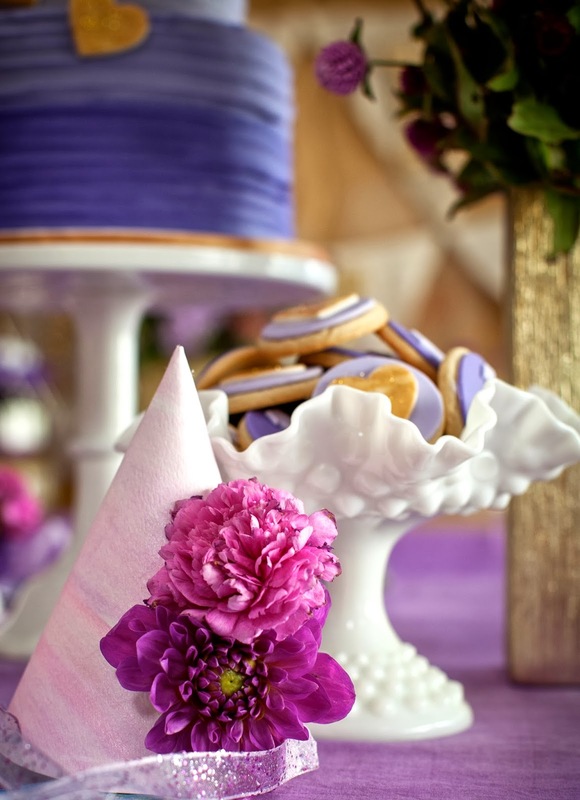 This party was as fun an cheerful as the family we were celebrating with! Hope you enjoy the photos. 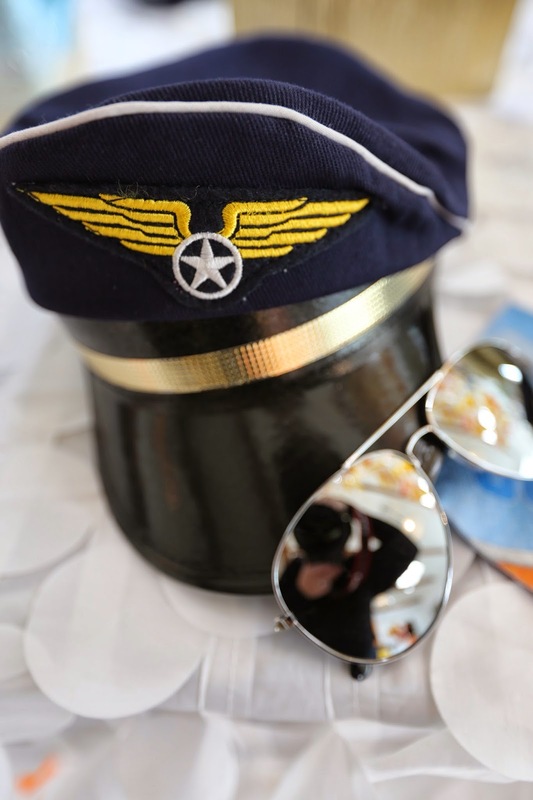 Here are some shots from a fun Plane party we did recently. It was a Whole COOP and CABOODLE package... so we handled the cupcakes (mom also asked us to add a cake... which we did! 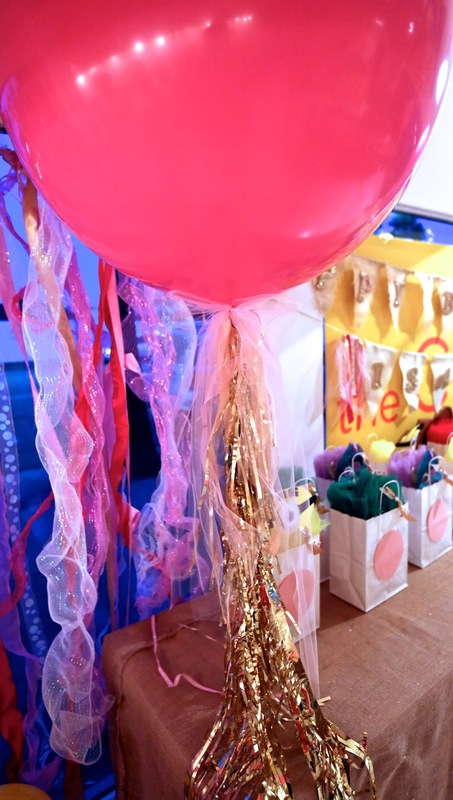 ), fresh flowers, large lollipops, adult food and some extra snacks and special juice and cups for the kiddos - in addition to the fabulousness you get (goodie bags, decor) you get with a theme party at the COOP. 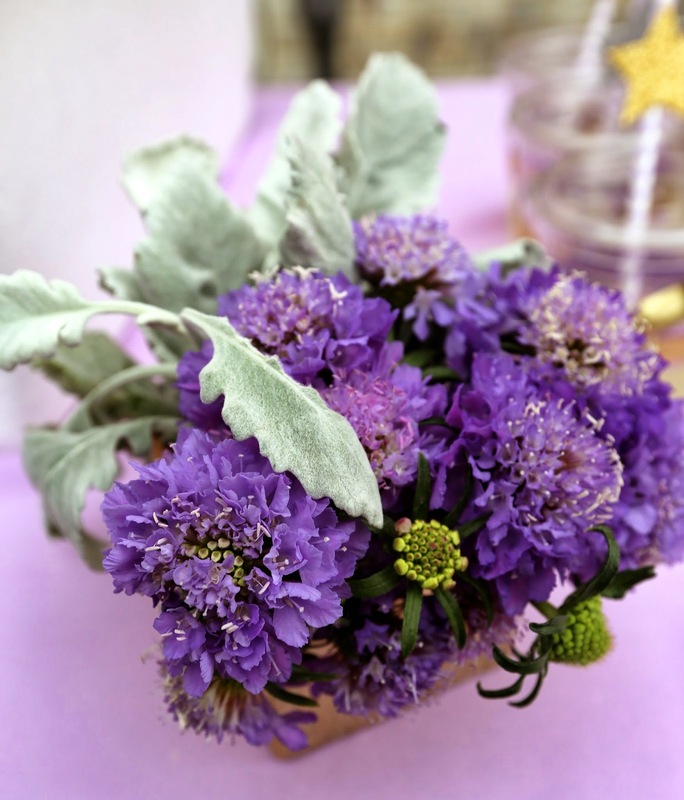 I really wanted to figure out a cool and fun centerpiece... I was thinking of clouds. 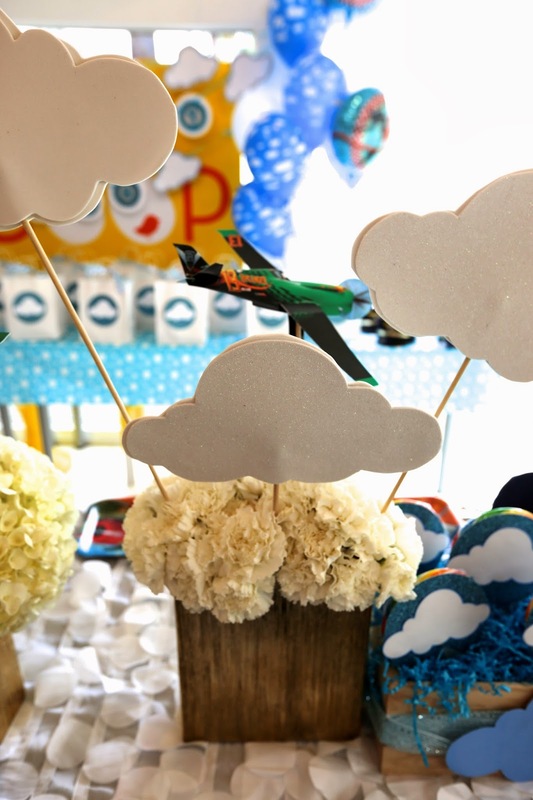 I was so excited when I thought of using the FLOWERS as clouds-- as well as some foam cut out clouds on sticks coming out of the flowers arrangements (hydrangeas and white carnations.... ) I LOVE how it turned out. Clouds, clouds, clouds... I used a lot of cloud images for this party. The cloud looked more cool and modern than a plane image, I thought. Mom was so so incredibly sweet... and she love love loved every bit of it. 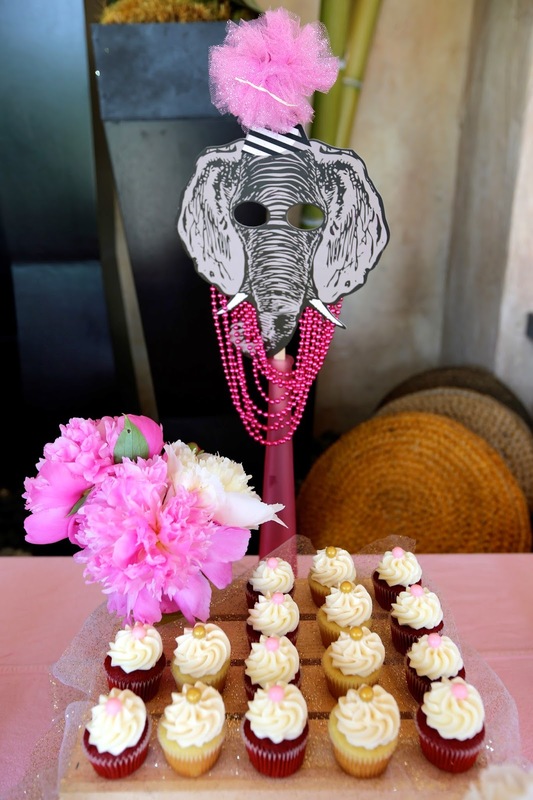 Her daughter didn't want ANYTHING girlie... but I still think the party had enough of a feminine feel to make it extra special! 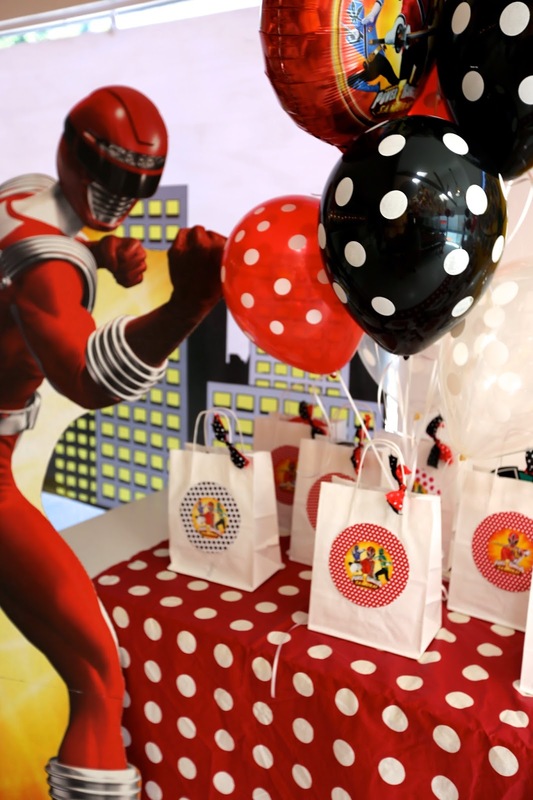 Super short post here... just wanted to share a couple of cool photos from a POWER RANGER COOP an dCABOODLE party we did a while back. 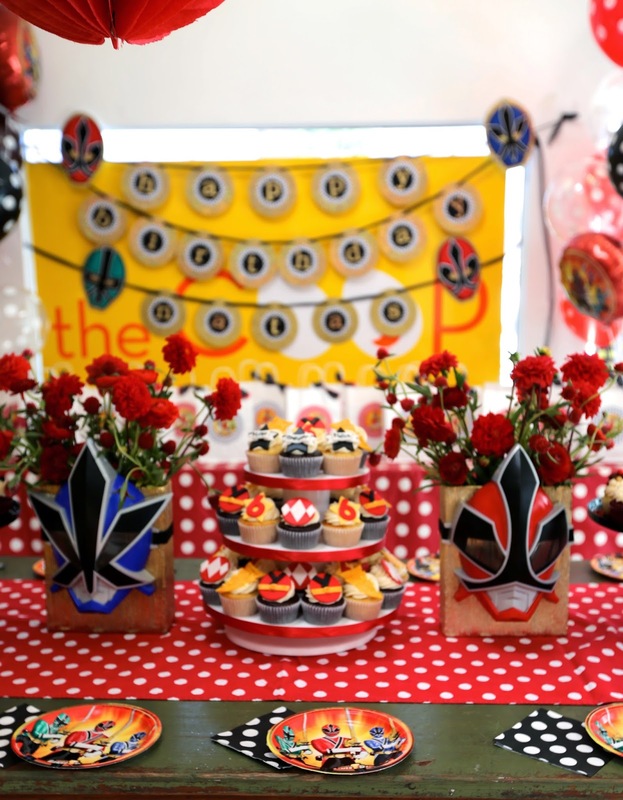 I love the dots in red and black -- and the cool masks as decor on the flower vases, don't you. 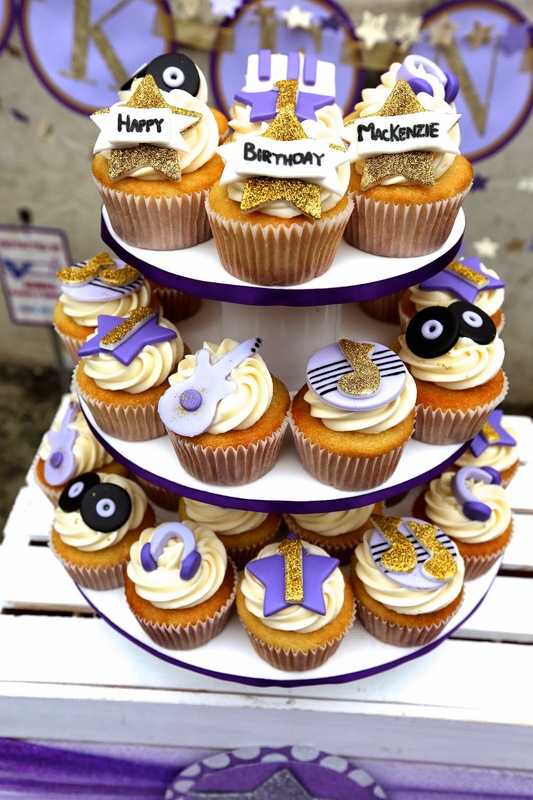 This was a great fun vibrant party... hope you enjoy the photos! !